You will need Go 1.9+ set up on your machine. Git Bash or similar is required on Windows. In this tutorial, we will explore how Pusher Channels can be used to share your terminal as a web page. If you want to play around with the code as you read this tutorial, visit this GitHub repository, which contains the final version of the code for you to check out and run locally. A feature such as this is already available in CI servers, you already monitor in realtime the output of your build. It can also help in situations where you want a colleague to help troubleshoot an issue and don’t necessarily want to send log files back and forth, the colleague can take a look at your terminal directly instead. Golang (>=1.9) . A working knowledge of Go is required to follow this tutorial. A Pusher Channels application. Create one here. Git Bash if you are on Windows. An important aspect to this is implementing a Golang program that can act as a Pipe. So in short, we will be building a program that monitors the output of another program then displays it on the web UI we are going to build. 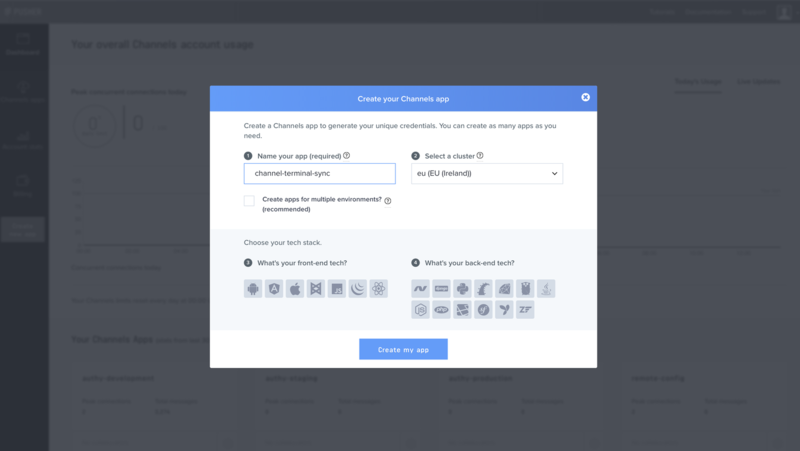 You will then be redirected to a control panel for your app where you’d be able to view the information about the app and more importantly, the authorization keys you need to connect to the application. Start an HTTP server that displays the output of another program (the one being piped) in realtime. Please remember to replace the placeholders with the original values. They can be gotten from the control panel. The next step of action is to create a main.go file. This will house the actual code for connecting and publishing events to Pusher Channels so as to be able to show those in real time on the web. While the above code is a bit lengthy, I’d break it down. Line 35 - 38 is probably the most interesting part. We make sure the program can only be run if it is acting as a pipe to another program. An example is someprogram | ourprogram. Line 66 - 88 is where we start the HTTP server. The server will load up an index.html file where the contents of the program we are acting as a pipe for will be seen in realtime. Maybe another interesting thing is var once sync.Once. What sync.Once offers us is the ability to perform a task just once throughout the lifetime of a program, with this we load the contents of index.html just once and don’t have to repeat it every time the web page is requested. Line 109 - 125 is where we actually send output to Pusher Channels. Nothing too fancy right? We just make the website’s background black and try to mimic a real terminal. All is set and we can go ahead to test our program. A major key to testing this is an application that writes to standard output, such programs like cat or a running NodeJS program that writes log to standard output. All is set right now for us to test. To do this, we will need to build both the UUID generator and our actual program. In this tutorial, I have described how Pusher Channels can be leveraged to build a realtime view of your terminal. This can be really useful if you want to share your terminal with someone else on the same network as you are or with a tool such as ngrok. You could do something like ngrok http 1500 and share the link with someone else. As always, you can find the code on GitHub.